Matti Raekallio (...) plays with a shot-from-guns virtuosity that carries all before it. Voici l'occasion rêvée d'acheter un des meilleurs cycles des Sonates de Prokofiev. Tout y concourt pour une réalisation absolument superbe. Die (...) Edition jedem Hörer zu empfehlen, der alle neun Sonaten auf CD sein eigen nennen möchte - und darüber hinaus ein erkleckliches Maß an Prokofieff-Repertoire als Zugabe erhält. Raekallion soitto on pidäkkeettömän lennokasta, voimallisesti muotoiltua, määrätietoisesti väritettyä ja erehtymättömän taiturillista. Lyyristä tyyneyttä ja romanttisuuteenkin taipuvaa lempeyttä löytyy, vaikka murskaava vasarointi puskeekin pintaan liian herkästi. 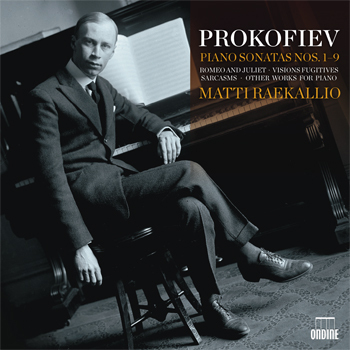 This 4-CD collector's box features Matti Raekallio with piano solo music by Sergei Prokofiev, including a complete set of the nine Piano Sonatas. Also included are the famous Ten Pieces for Piano from Romeo and Juliet, Visions fugitives, and Sarcasms, as well as further cycles and popular piano pieces. All recordings from this set were previously released to great critical acclaim, including (10/10) accolades from ClassicsToday.com. David Hurwitz has hailed these sonata recordings as "maybe the finest complete survey of the sonatas available". Finnish-born pianist Matti Raekallio has built an international reputation particularly upon making these Prokofiev recordings between 1988 and 1999 ("I don't think there's any other pianist who has surveyed significant chunks of this repertoire with a sharper ear for the way that details of texture, rhythm, and articulation interact." - Fanfare Magazine, March/April 2000). A prolific pedagogue, Matti Raekallio joined in 2007 the faculty of the Juilliard School in New York, having previously held professorships at Western Michigan University, as well as in Helsinki, Stockholm, and Hanover.